Living room flooring installation: First thing about installing a floor is choosing the right floor. At Flooring America they can help or maybe Home Depot or Lowe’s where ever. Once you have your floor picked out we can now talk about installation. Step #1 Sweep the area clean from debris, than lay out rosin paper tape or tack down paper using staple gun. 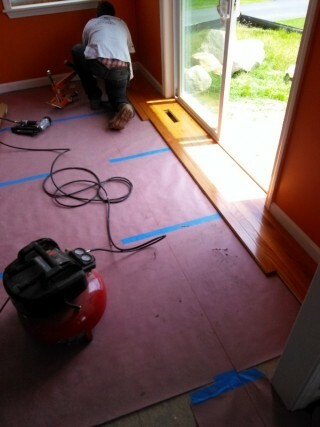 Step #2 Open box of hardwood flooring spread them out mix up pieces. Start at one side of room you are going to need a finish gun and the floor nailer.Make sure you leave 3/8 on each edge for floor expansion. 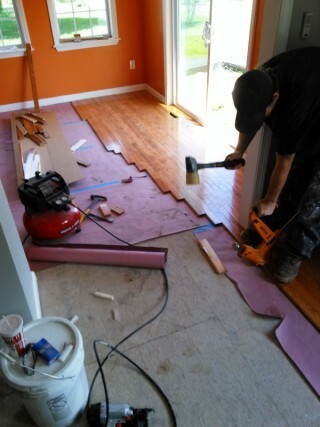 Starting with the finish gun nail down your hardwood flooring strip tongue facing away from the wall. Nail it in the tongue do this for about five rows till you can get flooring nailer in. Hardwood flooring seems should not be closer than 8″ apart. Use cut off piece for other side for less wastage. Step #3 Continue running the hardwood floor following step 2 and make sure you watch out for damage piece. Step #4 Coming up to the end you are going to need a flat bar to pry and finish gun again. Use pry bar to pry hardwood flooring together than face nail it try and hit a joist. Step #5 Clean floor and enjoy that it. Copyright © 2019 Sunnyside Services, LLC. Powered by WordPress & Corpo Theme.